This Item Priced and Sold as Each. Please add two to your cart for a pair. 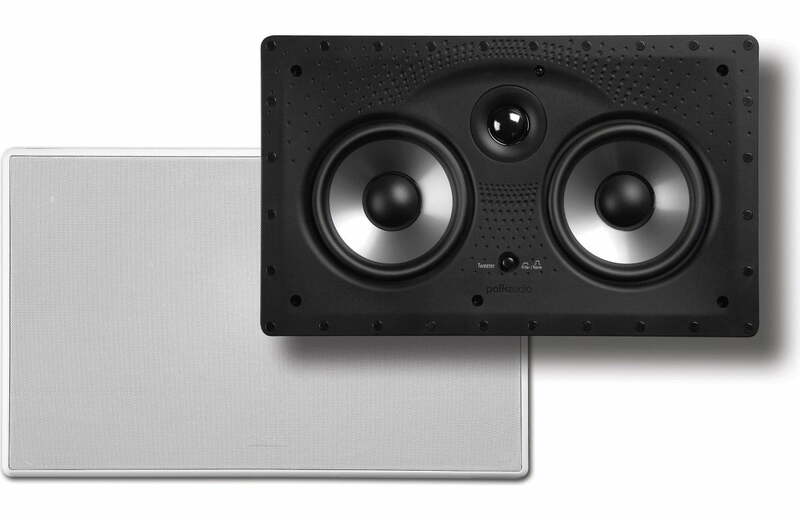 Enjoy sensational sound in a seamless design with this Polk Audio VS 255C-RT in-wall centre speaker from Polk Audio. Its wafer-thin Sheer-Grille protrudes a mere 7mm from the wall and is painted to match your décor and blend right into its surroundings. Features like reflective room compensation and PowerPort bass venting ensure crystal-clear audio with deep, punchy bass. With a Vanishing Series Polk Audio VS 255C-RT In-Wall Center Channel Speaker, you have the centerpiece of a world-class stealth home theater. All you see is screen, and all you hear is crystal clear dialogue, dynamic detail and directional effects. The Vanishing Series center channel speaker anchors the action without attracting attention. It’s the state-of-the-art in today’s most-wanted interior design plans. This in-wall center channel speaker is built to perform. Potent drivers work with the PowerPort® bass technology to deliver punchy lows. Polk’s silk tweeter conveys every breath of dialogue. And it’s swivel mounted so you can aim the sound toward your listening position, for better performance. All of this from a center channel speaker that’s out of sight, in more ways than one. 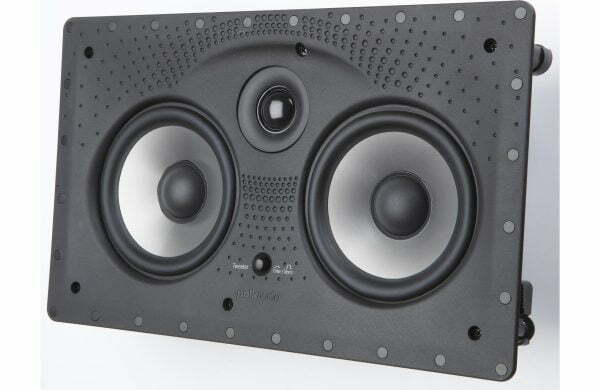 The Polk Audio VS 255C-RT is voice-matched to Polk’s free-standing RTi speakers. It can mingle with matching towers or bookshelves. Or it can join in harmony with other members of the “Vanishing” RT speaker family. The Vanishing Series Polk Audio VS 255C-RT is the centerpiece of a world-class stealth home theater. Paintable to match any décor, this in-wall center channel speaker blends in perfectly with its surroundings. Anchoring all the action without attracting attention, the 255c-RT ensures all you see is screen, and all you hear is dynamic, crystal clear sound. Vanishing Series In-Wall Center-Channel Speaker: The Polk Audio Vanishing Series in-wall center-channel loudspeaker (Polk Audio VS 255C-RT) features a precision-engineered minimally flanged design and Polk’s exclusive Sheer-Grille, which protrudes only 7mm from its surroundings. Installing virtually-flush in your wall, the Polk Audio Vanishing Series in-wall center-channel loudspeaker offers a one-cut, drop-in installation and rotating cam stabilizing system. The Polk Audio Vanishing Series in-wall center-channel loudspeaker provides superior high-performance sound from its dual 5.25″ woofers and aimable 1″ tweeter, with Reflective Room (Tweeter) Compensation control. Klippel Optimized Motor Structures: The Klippel Distortion Analyzer allows Polk engineers to optimize each driver’s motor structure, voice coil alignment and suspension to insure smooth, unimpeded movement even at extreme listening levels. This is especially important in the shallow depth area afforded an in-wall built-in loudspeaker. Dual Midranges: The Polk Audio Vanishing Series in-wall center-channel loudspeaker employs two 5.25″ Dynamic Balance mineral composite polypropylene cone midrange drivers with rubber surrounds for a smooth, consistent frequency response. Each midrange driver features a lightweight, strong composite basket that work in conjunction with Klippel Optimization to keep moving parts in rigid alignment while further damping performance-robbing resonances. Silk Dome Tweeter: The Vanishing Series in-wall center-channel loudspeaker employs a 1″ Dynamic Balance silk polymer composite dome tweeter for crisp, clear imaging. The high-performance silk dome tweeter in the Vanishing Series in-wall center-channel loudspeaker features a 15° swivel housing, for more direct high frequency control, excellent off-axis imaging and more placement flexibility. Reflective Room (Tweeter) Compensation Control: An easily accessible Reflective Room (Tweeter) Compensation switch allows you to make advanced audio tweaks to optimize the sound for any installation. Use the Reflective Room (Tweeter) Compensation switch to digitally compensate for harsh reflective surfaces. It doesn’t merely reduce high frequencies; it actually allows you to “notch-out” a specific area of the spectrum (3500-6000Hz) where room acoustics most often interfere with performance. Timbre Matched: The Polk Audio VS 255C-RT Vanishing Series in-wall center-channel loudspeaker is timbre-matched to Polk Audio’s high-performance RTi bookshelf and floor-standing loudspeakers. This allows you to match them to an existing Polk Audio home theater speaker system and enjoy seamless blending from speaker to speaker. Timbre-matched speaker components will insure the same true response throughout your system. Frequency Response: The overall frequency response of the in-wall center-channel loudspeaker is 30Hz to 27kHz, and the -3dB frequency response is 50 to 25kHz. Wafer-Thin Sheer-Grille: The Polk Audio VS 255C-RT Vanishing Series in-wall center-channel loudspeaker features Polk’s exclusive wafer-thin Sheer-Grille, a magnetically-secured grille that protrudes only 7mm from its surroundings. The Sheer-Grille can be painted to match your décor, making it virtually indistinguishable from its surroundings. The Sheer-Grille has nearly transparent, ultra-small perfs, and are acoustically inert, for dynamic, unimpeded sound and more uniform coverage, even in larger rooms. Note: We highly recommend you use a can of spray paint matched to the wall color you want the Sheer-Grille to blend with. Never use a brush or roller to paint the grille, as this will clog the perf holes. Gold-Plated Spring-Loaded Posts: The in-wall center-channel loudspeaker has a gold-plated pair of spring-loaded binding posts that can accept up to 12-gauge wire, single banana plugs, or pin connectors. Applications: You can use the Polk Audio Vanishing Series in-wall center-channel loudspeaker to complete a system of traditional loudspeakers or in-wall speakers, by adding an inconspicuous center-channel speaker. Placement: The in-wall center-channel loudspeaker is designed to be installed above or below your flat-panel television. 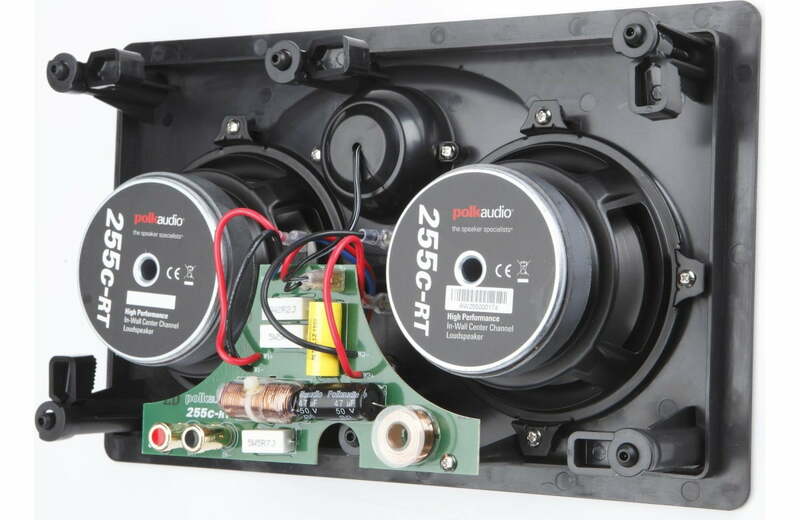 Install the in-wall center-channel loudspeaker as close to ear level as possible. If the speaker needs to be installed lower or high than ear level, then aim the tweeter accordingly. Note: Do not block the in-wall center-channel speaker with your TV or furniture, as this will disrupt and muffle the sound. Rotating Cam System: The Polk Audio in-wall center-channel loudspeaker utilizes a rotating cam system to ensure a secure, vibration-free installation. Installation: The Polk Audio Vanishing Series in-wall center-channel loudspeaker (255c-RT) can be installed in new or existing construction. Existing Construction: In existing walls, use the included cardboard template for one-cut, drop-in simplicity. Achieve secure, vibration-free efficiency with a simple turn of Polk’s Rotating Cam system (5 rotating cams).